Due to manufacturing issues Mason Pearson are having there are severe stock issues across most lines in the UK. If the item is showing as out of stock it could take up to 6 months to come back in. A great detanger for thicker hair. With 7 rings of nylon tufts to stimulate blood flow to the hair roots, the density of the bristles allow conditioning sebum to be more evenly distributed from the roots to the ends of the hair. Regular brushing plays an important part in the condition of your hair. Brushing spreads essential oils along the length of the hair giving it strength, suppleness and producing a healthy sheen. To maintain the quality of the Mason Pearson hairbrush it is not mass produced. Most of the work is carried out by hand, using techniques pioneered and patented by the founder -Mason Pearson- over one hundred years ago and improved over succeeding generations. Mason Pearson Brushes Nylon Universal is rated 5.0 out of 5 by 8. Rated 5 out of 5 by Beth96 from Excellent hairbrush! My old Mason Pearson brush was on its last legs and I was looking for a new one. I love the blue colour, black is so boring. The nylon bristles are ideal for my thick curly hair and I have found that my hair is less flyaway as a consequence of using nylon bristles. Lovely weight and nice and compact. A good buy. Rated 5 out of 5 by amanda4111 from Really lovely brush I am so glad I made this purchase, as I have wanted a Mason and Pearon brush since I was 7 and my friend had one (I'm now 36, so I've been waiting a while!). I love it, the nylon universal is perfect for someone with long think hair like I have. I have it in ivory, which is classic yet feminine. I have also bought two of the children's blue ones for my little boys, as I want these brushes to remind them of their childhood. All their range are lovely, and a cut above your average hair brush. Rated 5 out of 5 by AFM2013 from Great hairbrush Decided to treat myself to a decent hairbrush & this seemed like the one to go for. I love it and it seems to be doing the trick in terms of calming the frizz down! The service from Escentual was quick & efficient too. Rated 5 out of 5 by Buttie from It's back to using the best.......... I have long thick hair and for many years I used one of these brushes. I moved from London to a small town and had the choice of buying brushes from Boots / Superdrug etc. Nothing went through my hair or lasted long. For me buying other brushes was/is a false economy. 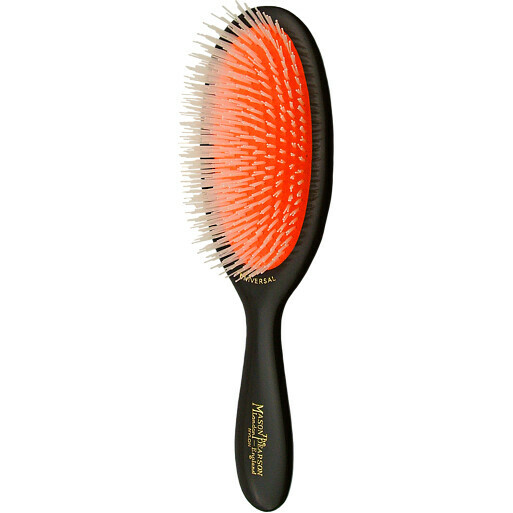 I love this brush, it goes through my hair and removes tangles without tears!